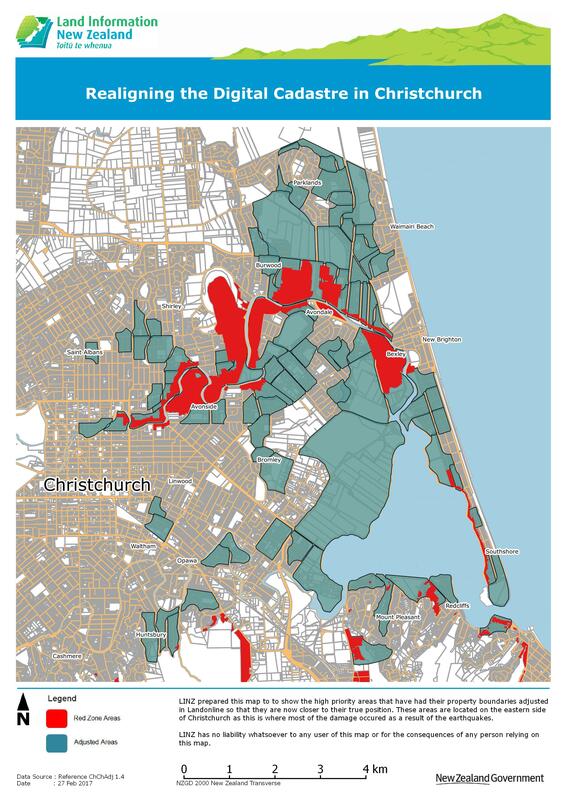 The Canterbury Property Boundaries and Related Matters Act 2016 came into law on 30 August 2016 and introduced new principles for determining boundaries affected by earthquake movement in greater Christchurch. To support the Act new cadastral rules have been made by the Surveyor-General. The Cadastral Survey Amendment Rules 2017 were gazetted on 2 March 2017 with effect from 24 April 2017. These rules amend the Rules for Cadastral Survey 2010 with the addition of rule 20 Cadastral survey rules for greater Christchurch. All cadastral surveys and Cadastral Survey Datasets (CSDs) in greater Christchurch must be in terms of the amended rules. On 24 April, a consolidated edition of the Rules for Cadastral Survey 2010 was published on the government legislation website. This edition incorporates amendments made in 2012 and 2017. The Surveyor-General has published guidelines about Rule 20 (Cadastral survey rules for greater Christchurch). Read about Rule 20 Cadastral survey rules for greater Christchurch. Note: this information may continue to be updated where necessary. All guidance issued prior to 2 March 2017 on surveying earthquake-affected boundaries is no longer valid for surveys in greater Christchurch. The Surveyor-General recognises that some survey marks will be destroyed by post-earthquake reconstruction activities in Canterbury. The Interim Standard for mark protection surveys (Canterbury Earthquake) (LINZS10004) provides the Surveyor-General’s approval under section 55(5) Cadastral Survey Act 2002 for the removal of survey marks for the purposes of post-earthquake reconstruction, subject to the requirements in the standard being met. The standard is not to be used where the purpose of the survey is to redefine a boundary or to define land for title purposes. In these cases, the Rules for Cadastral Survey 2010, and in particular Rule 20.8 - Removing boundary marks, apply. In early 2017 LINZ updated the spatial representation in Landonline to reflect boundaries in their post-earthquake positions. The targeted area for realignment was the eastern side of Christchurch, as it had the most earthquake damage due to shallow ground movement. Coordinates were calculated in areas affected by shallow ground movement (shown blue on the map) that best reflect where survey marks and boundary positions are located after the earthquakes. summarises the key features and limitations of the information that need to be considered when using the data. The report does not attempt to delineate areas where ground movements may have an impact on cadastral surveys, nor does it propose any solutions for these issues. The map of indicative shallow surface movement in Christchurch shows the general extent of lateral shallow surface movement in Christchurch. It extrapolates movements that have been measured at a network of geodetic survey marks around Christchurch typically spaced hundreds of metres apart. Movement at the individual property level may be significantly more or less than the value indicated on the map. The Greendale Fault ruptured the ground surface, causing up to 5 metres horizontal and 1.3 metres vertical offset, during the 4 September 2010 Darfield (Canterbury) Earthquake. Additional information on the Greendale Fault can be downloaded from the related external links below. Note that rule 18 (Boundaries affected by ground movement) does not apply to a cadastral survey of land affected by the rupture of the Greendale Fault. Rule 20 includes the specific requirements that apply to the conduct of cadastral surveys and cadastral survey datasets located in greater Christchurch. Read about Rule 20 Cadastral survey rules for greater Christchurch.